What make's College Consulting SG different from other personalised consultancies, is the attention to application statistics and your child's profile. Just as much as overseas applications are an art, it's undoubtedly a science as well. Every family that works with my practice, receives free and complete access to College Consulting SG's online platform. The platform provides your family with the resources and tools to make intelligent application decisions as well as guide you, inform you, and keep you on track with your child's applications. 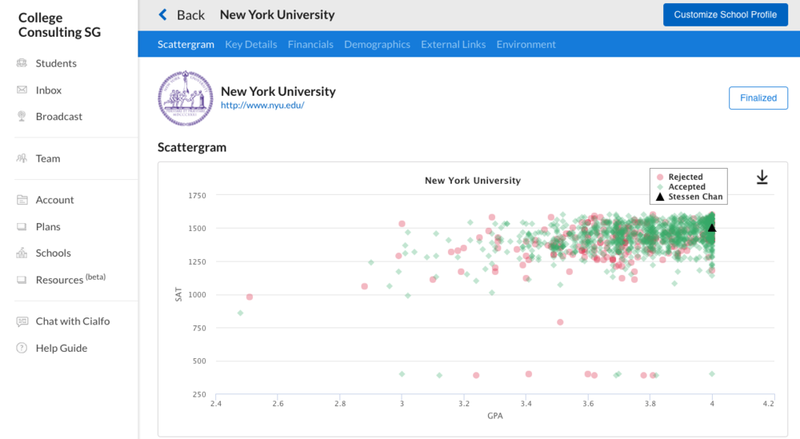 University Statistics — Unsure about your chances? Our global database of acceptances will examine your academic profile compared to thousands of other successful and unsuccessful applicants. Application Management - Shortlist the colleges you'll be applying to and the platform will help you determine what you need to do, how to do it, and when to do it by. Student & Parent Updates — Parents are always kept in the loop. Upon registration, I send you and your family reminders about upcoming tasks and deadlines. In-depth College Profiles — Learn more about the colleges you're applying to: what they look for, if financial aid is available, what campus life is like, and more!